As you know, here at Horizon Goodwill, we are on a mission to remove barriers and create opportunities. Recently, our team had the opportunity to break barriers along with a group of young girls who stepped up to take the lead in a Girls Engineering camp. Our Goodwill and SourceAmerica joined forces to show girls just how much fun it is to work in the Science Technology, Engineering, and Mathematics (STEM) industries. According to National Girls Collaborative Project, women make up half of the total U.S. college-educated workforce, but only 29% of the science and engineering workforce. Twelve high schools within Montgomery County Public Schools (MCPS) offer a national pre-engineering program of study called Project Lead the Way (PLTW). The young women were immersed in some hands on learning. Twenty girls entering ninth and tenth-grade this year from the twelve PLTW schools took part in an action-packed five-day camp, held this year at Rockville High School. 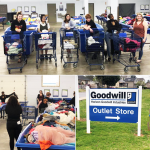 These engineering students from Montgomery County Maryland had the task of helping Horizon Goodwill improve our efficiency and job accessibility for our E-Commerce division in Hagerstown, MD. First they studied our Goodwill’s e-commerce practices and our online marketplace platform shopgoodwill.com®. Then, in an additional eight hours over the next two days, teams of 2-3 girls designed their projects and prepared presentations with functional prototypes. 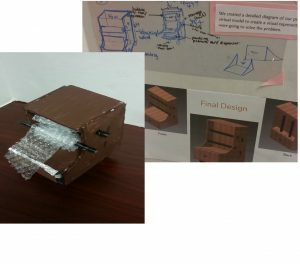 From concept to computer design to physical prototype in 4 days! These girls are amazing. Personally, I was so excited to work with these girls — I wish I had been introduced to engineering when I was young. Engineering drives your business’s bottom-line and re-engineering drives innovation, efficiency, and production. Most importantly, engineering is all about changing perspective – looking at something differently – well, it can absolutely redefine what capability looks like. Together with the public school systems and some innovative women, we are removing the barriers of disparity for girls that only boys can be successful in an engineering workforce. Kim Starks and Jennifer Forrest led the Girlz in Engineering Camp and are both teachers in the Montgomery County Public School system with extensive experience in both engineering and tech industries. “Girls need to have the encouragement to take an interest in STEM careers, especially engineering because there are so few women in these fields. As a female in civil engineering, I was a minority, but I stuck with it, having support from my parents and the Society of Women Engineers. The number of women in technology fields is still small. I don’t think girls need to try to “prove” anything–they just need to build confidence and have support. There are competent girls who may not have had exposure or support to consider a traditionally “male dominated” field. Plus, I want them to see that engineering is so broad; it can open doors to many other areas as well, including education, law, business, medicine, and so on,” says Jennifer Forrest, Technology Education Teacher at Rockville High School. Goodwill really is so much more than our stores – we are playing our part to help break down those boundaries and encourage more girls to take up STEM careers. Girlz Engineering Camp gave girls a real world STEM learning experience and connected technical problem solving to social impact work for future leaders. Horizon Goodwill Industries' "Reimagine Runway" contestants are in full designer mode! Make sure check out Friday Night Music on June 7th and 14th at ... Read More about Reimagine Runway Gets News Coverage!